SINGAPORE – Gold clung to overnight losses on Friday, hurt by strong US economic data that bolstered prospects of higher interest rates, but the metal looked set to snap a three-week losing streak on earlier gains from a softer dollar. Bullion’s failure to garner safe-haven bids despite the worsening of talks over the Greek debt crisis raised some concerns with traders. Spot gold was little changed at $1,182.35 an ounce by 0331 GMT, after losing 0.4 percent in the previous session. The International Monetary Fund dramatically raised the stakes in Greece’s stalled debt talks on Thursday, announcing that its delegation had left negotiations in Brussels and flown home because of major differences with Athens. 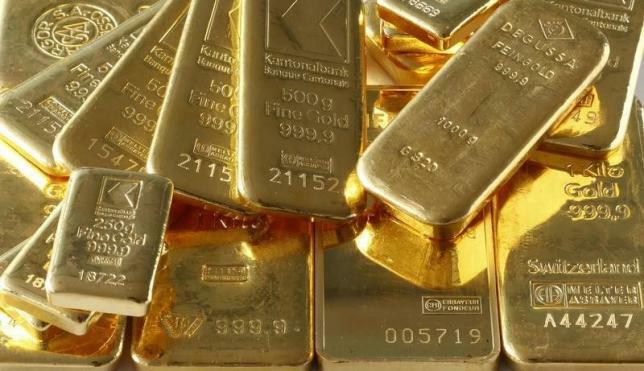 “So far gold has only been mildly supported by the ongoing Greek saga,” said HSBC analyst James Steel. Greece needs a deal to unlock aid before the end of the month when it is otherwise set to default on a 1.6 billion euro ($1.8 billion) repayment to the IMF. That could trigger capital controls and possibly push Greece out of the euro zone, with unpredictable consequences for financial markets and the European economy. Gold typically sees safe-haven demand during times of financial uncertainty, although any gains could be short lived. Also weighing on gold was data on Thursday that showed U.S. retail sales surged in May, the latest sign economic growth is finally gathering steam. The firming economy could likely prompt the Federal Reserve to raise interest rates in September. Higher rates would dent demand for non-interest-paying bullion, and boost the dollar. The greenback clung to modest gains on Friday, having drifted higher on fresh evidence that the U.S. economy was gaining momentum, but it was poised to close the week down 1.4 percent, after sharp losses against the yen earlier in the week. The dollar softness is helping gold post a 1 percent gain for the week, after three straight weeks of losses. Weak physical demand and outflows from exchange-traded funds continue to undermine gold prices, said traders. Expectations of a further drop in gold prices and better returns from surging equities in China have tamed demand for the precious metal in Asia despite recent price declines.